Like many other users, I use an Ethernet cable when I am at work and use Wi-Fi when at home to connect my laptop to the internet. Although Wi-Fi is available at my workplace as well, I prefer using the Ethernet cable to improve my laptop’s battery life. Moreover, Ethernet is always faster than Wi-Fi. 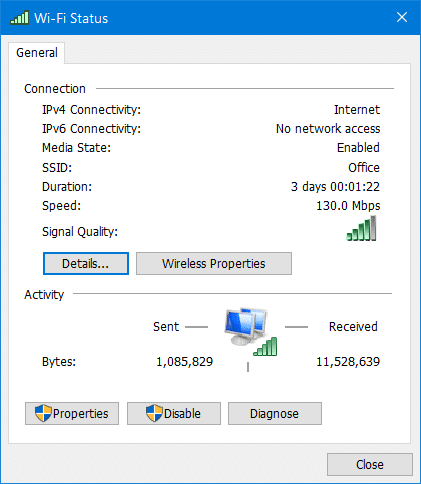 When you connect an Ethernet cable to a Windows 10 PC which is already connected to a Wi-Fi network, Windows 10 automatically uses the Ethernet connection instead of the Wi-Fi network. The problem is that Windows 10 doesn’t automatically turn off the Wi-Fi when you connect an Ethernet cable. You need to manually turn off the Wi-Fi if you want to turn it off to save some power. Would not it be nice if Windows 10 could automatically turn off your PC’s Wi-Fi as soon as an Ethernet cable is connected to your PC? Yes, Windows 10 does provide a provision to automatically turn off Wi-Fi when you connect an Ethernet cable to your Windows 10 PC. IMPORTANT: The provision to automatically turn off Wi-Fi when you connect an Ethernet cable might not be available on your PC. This is because some network adapters don’t support this feature. Here is how to configure Windows 10 to automatically turn off Wi-Fi when an Ethernet cable is connected. NOTE: We are assuming that your Windows 10 PC is currently using a Wi-Fi network to connect to the internet. Step 1: Right-click on the wireless/network icon in the system tray and click Open Network and Sharing Center. Step 2: Here, in View your active networks section, click on the currently connected Wi-Fi connection (see picture below) to open Wi-Fi Status dialog. 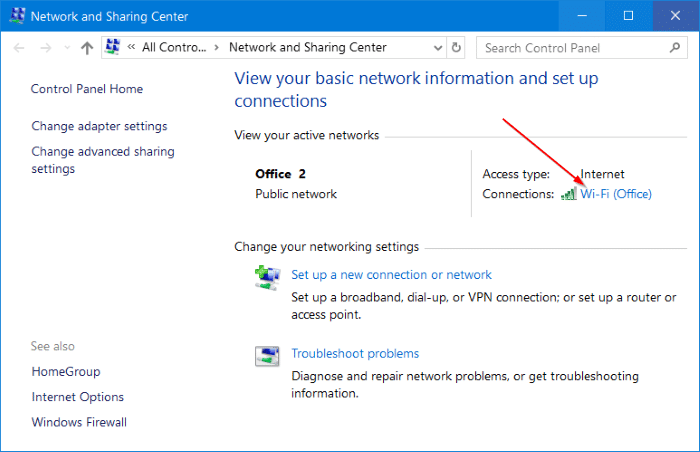 If your PC connected to an Ethernet connection, please connect to Wi-Fi and perform this step again. Step 3: Click the Properties button to see Wi-Fi Properties dialog. Step 4: Under the Networking tab of Wi-Fi properties dialog, click the Configure button. 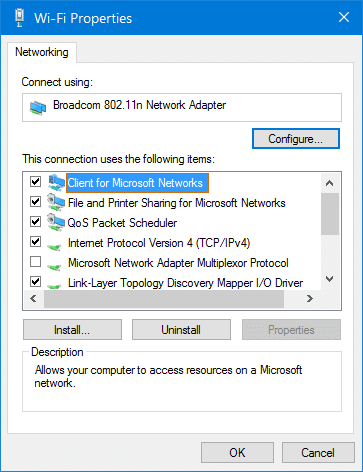 This action will open the properties dialog for the network adapter. Step 5: Switch to the Advanced tab. 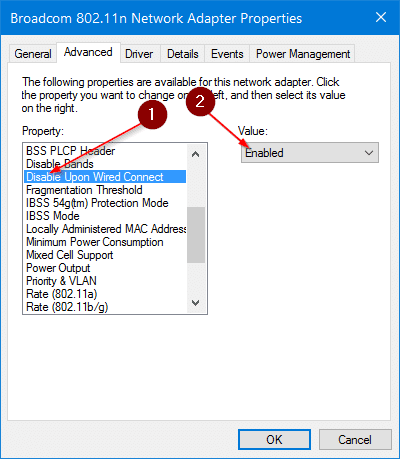 In the Property section, look for Disable Upon Wired Connect entry. Select Disable Upon Wired Connect entry, choose Enabled from the Value drop-down on the right side. NOTE: If the Disable Upon Wired Connect option is not appearing, it’s likely because your network adapter doesn’t support this feature. Try out the other method mentioned below to automatically turn off the Wi-Fi adapter upon connecting an Ethernet cable. Finally, click OK button. That’s it! From now on, whenever you connect an Ethernet cable to your PC, Windows 10 automatically turns off the Wi-Fi. 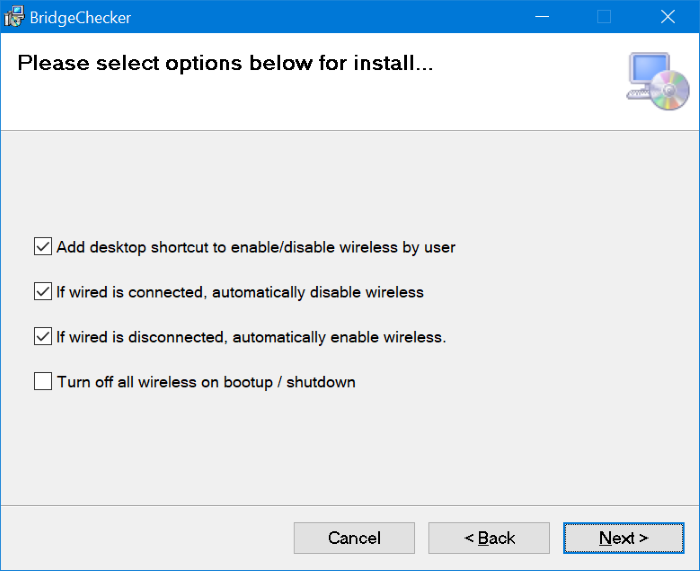 BridgeChecker helps you to automatically turn off the Wi-Fi when you connect an Ethernet cable to your PC. Although the software is not free, you can try it out for 30-days before buying it. Also check out our how to view saved Wi-Fi passwords in Windows 10.